Much of trauma healing is helping the nervous system become more “resilient.” Rather than spend a few hours or even days drowning in a state of terror, tension and nervousness after getting triggered, doing one or more of these exercises can help the nervous system shift into a different state sooner. Each time you do an activity or exercise like the ones below, this teaches the nervous system to be more flexible and rebound from activation sooner. After some type of physical injury that leaves some of your muscles weak or atrophied, you may need to go to physical therapy and exercise the muscles to strengthen them again. After trauma, the nervous system is completely out of whack and the resiliency muscles, so to speak, are very weak. 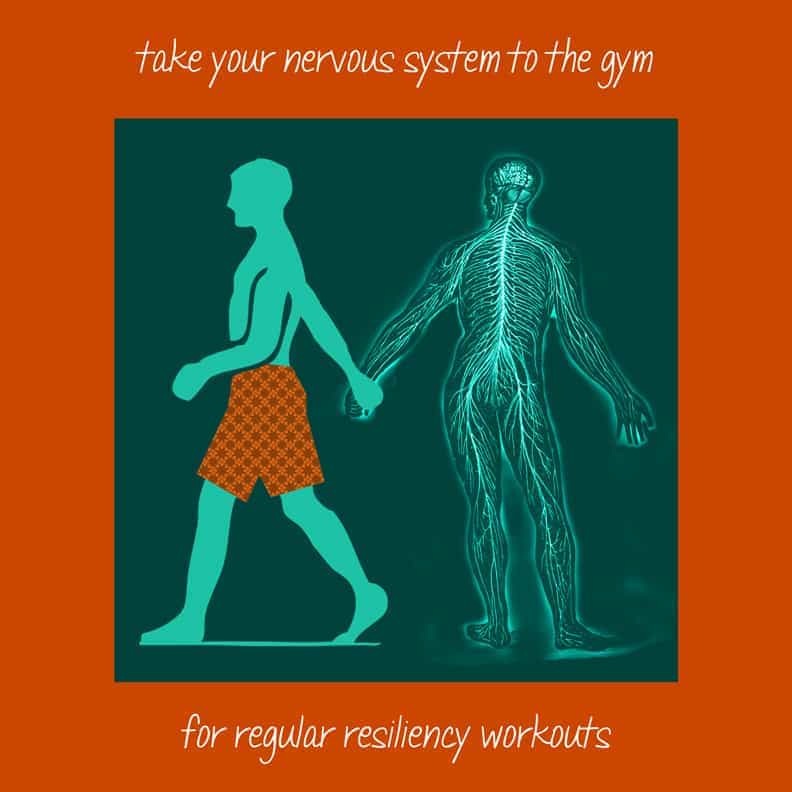 Practicing resiliency exercises on a regular basis is like going to a “Nervous System Gym” and exercising the healthy functions of your nervous system until they become strong once again. 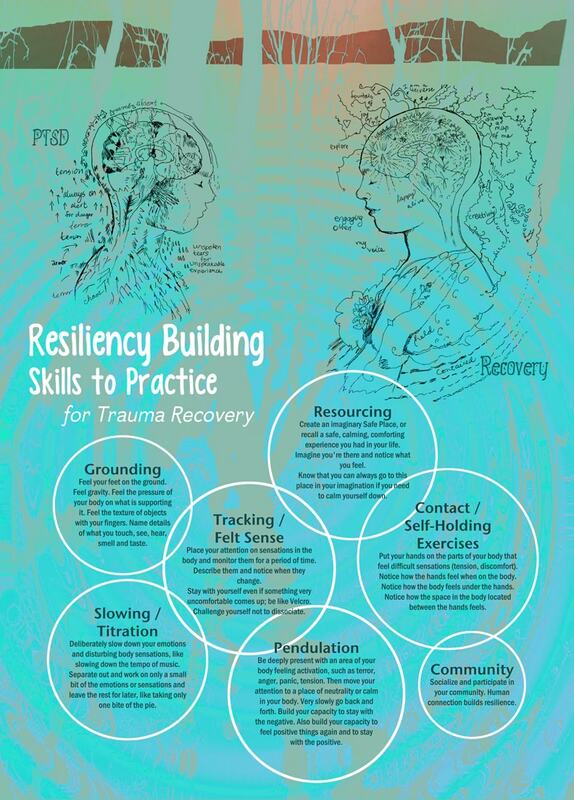 In fact, going to a Trauma Resiliency Model or Somatic Experiencing therapist is kind of like seeing a Nervous System Physical Therapist or Nervous System Personal Trainer. When you see a regular Physical Therapist or Personal Trainer, they will give you homework to do in the gym or at home before the next week’s session. In the same way, if you go to therapy for trauma once a week, it’s good to also practice these things on your own between sessions to get those muscles worked out enough to improve your functionality over time. Feel the pressure of your body on what is supporting it. Feel the texture of objects with your fingers. Name details of what you touch, see, hear, smell and taste. Place your attention on sensations in the body and monitor them for a period of time. Describe them and notice when they change. Stay with yourself even if something very uncomfortable comes up; be like Velcro. Challenge yourself to stay present and in the moment. Deliberately slow down your emotions and disturbing body sensations, like slowing down the tempo of music. Separate out and work on only a small bit of the emotions or sensations and leave the rest for later, like taking only one bite of the pie. Create an imaginary Safe Place, or recall a safe, calming, comforting experience you had in your life. Imagine you’re there and notice what you feel. Know that you can always go to this place in your imagination if you need to calm yourself down. Be deeply present with an area of your body feeling activation, such as terror, anger, panic, tension. Then move your attention to a place of neutrality or calm in your body. Very slowly go back and forth. Build your capacity to stay with the negative. Also build your capacity to feel positive things again and to stay with the positive. Put your hands on the parts of your body that feel difficult sensations (tension, discomfort). Notice how the hands feel when on the body. Notice how the body feels under the hands. Notice how the space in the body located between the hands feels. Socialize and participate in your community. Human connection builds resilience. Practice placing your awareness on any emotion or sensation coming up inside you. Say towards it, “You are welcome here.” Stay with it in a loving, compassionate way. Work on reducing “should” thoughts about yourself. Allow yourself the space and time for your body, emotions and mind to embrace and pass through the processes they need to. Practice being gentle with yourself. Practice self-empathy. Recently, I created an online store for my blog (yay!). Skill #1 Tracking – Tracking involves placing awareness / presence on your sensations and finding words to describe them that are part of the language of sensation rather than the language of emotion or thought (such as “bubbling and tingling” as opposed to “happy and excited”). As these internal sensations shift and change, you continue to watch and be with them as witness, describing the changes as they happen. Tracking is an important skill to learn because tracking the sensations happening inside oneself is used while doing every other skill of TRM. “Tracking” of TRM is pretty much the same thing as the “Felt Sense” of Somatic Experiencing. Skill #2 Resourcing – The term Resourcing is very broad and pretty much all self-therapy somatic exercises act as Resources. “Resourcing” from TRM specifically is a technique in which you first briefly focus on naming the sensations you are experiencing related with being dysregulated (highly stressed and amped up or shut down and checked out). Then you change focus and spend a little time thinking of a good resource for yourself. The resource should be anything that, when you experience it within your active imagination, brings forth in your body a better state (even just a little better will work) than the challenging state you have been stuck in. So, the resource brings about either “neutral” or “positive” sensations. I am most familiar with the imaginary Safe Place and a memory of a settling experience, but there are many possible things you can use for this including: The moment any kind of danger or stressor went away and safety was restored, the moment help arrived, an object like a special possession, a pet, a person like a friend or relative, a special place like a park or room, an imaginary figure like a wizard, a mythical or literary character, an imaginary setting, a life experience, or an inner strength you possess like wisdom, open-heartedness, strength or determination. When searching for a resource, it’s good to allow your mind to kind of free associate without censorship and see what comes up, and just speak about whatever happens to be there even if it doesn’t seem like a resource. Even if it feels too chaotic to find anything, mention whatever is there. The mind may be presenting something that has some resource in it and you just have to start talking about it to realize there is one tiny moment or some object that the body feels settled by remembering. I think it’s nice that a resource doesn’t have to be positive but can be neutral. It can be such simple things like: a feeling of relief upon arriving home safe from driving, getting a moment to rest like the first moment in bed, a neutral feeling like sitting watching ducks on water, feeling settled when hanging out with a friend, a still feeling when looking at trees or plants, or just a basically OK feeling about life when talking on the phone or playing a game or brushing your hair or finding a nice sale item or just opening up your favorite snack. Note that if you bring up a resource that’s too positive for you to handle at the moment, such as the idea of winning the lottery or anything that would overwhelm you, this is called “over-resourcing,” and can cause dysregulation/ the inability to assimilate or “grok.” (just something to be aware of). Bringing up a memory from the past as a resource is actually one of the more complicated skills to learn because some memories are huge multi-faceted collections of both positive and negative things. When a “split resource” like this comes up, the TRM guide will help hone in on the most resourceful aspects of the memory and contain the others to potentially work on later if needed (without repressing them). Because of this complexity, resourcing using a memory of a past event is best learned with some guidance from someone experienced in the technique. So, back to the skill: When you settle on a resource, then you imagine being in that place and time and deepen your body’s experience of it. You name many details about the experience, such as weather, colors, names of people, textures, sounds and actions you took, which help to bring it into your body more and more. It takes a full 20 seconds of focusing into the felt experience of the internal sensations brought up in the resourced or resilient state for the nervous system to “reset” itself. The goal of resourcing is to briefly open up the negative responses and then reset the nervous system by deepening the more resourced neural pathways. Simply doing this in sequence — noticing the stress and then immediately bringing the resourced state online — demonstrates to the nervous system a new direction to take, new pathways to travel, that it had not had access to when stuck in stress. Once it resets it also brings online parts of the higher brain that were inaccessible while stressed. Everything about this resourcing process — from the greater presence placed around the stressful sensations prior to invoking the resource, to the new neural pathways brought online by deeply experiencing all the sensations of the resource as well as all the higher parts of the brain coming alive and accessible — actually change the internal stance or response to the original stressful situation that was causing trouble. The last step of this skill is noticing this change: you describe what has changed about how your body responds to the stressful situation you had focused on in the beginning. (This is optional) You can also pick 3 details that represent the experience of your resource best and memorize them. When you are stressed. you may experiment with bringing the 3 details back to mind and see if you can reset your nervous system this way. Note that it’s important not to unconsciously begin to invoke resources in order to try to escape, deny or gloss over bad things rather than to retrain neural pathways. It’s easy to try to use positive things to repress negative things if this has already been a coping mechanism. Skill #3: Grounding – Grounding includes processes to deepen your felt sense connection to the earth, gravity, your body, your sense of weight, location, place and 5 senses. Skill #4: Gesturing – Gesturing is a process of bringing awareness to spontaneous gestures/movements that are self-soothing in order to use them consciously and deliberately to reduce activation. Skill #5: Help Now! – The skills taught for Help Now! 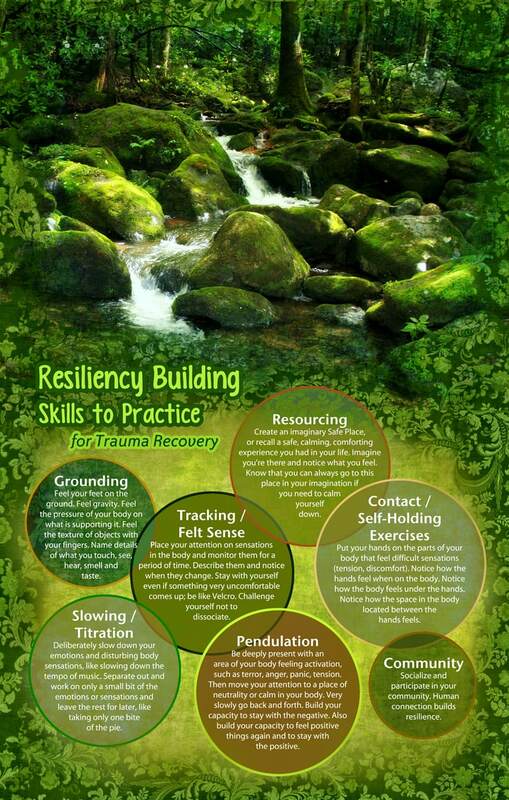 are quick, simple and practical (and easy to remember) strategies to get back into the Resilient Zone if experiencing emergency, extreme or very stuck states in which you find yourself completely overwhelmed and unable to get out of the trauma vortex. These emergency states include such things as: panic attack, meltdown, shock, “losing it,” going off the deep end, mental breakdown (due to trauma), utter paralysis, completely zoned out. Skill #6: Shift and Stay – Shift and Stay involves shifting into the Resilient Zone and challenging yourself to stay there. This is basically exercising a muscle that has gotten weak during the extreme stress of PTSD – the muscle being the capacity to remain in your Resilient Zone. Contact/Self-Holding Exercises I included Contact/Self-Holding Exercises from Somatic Experiencing in my list because of how much those exercises have helped me. They are my emergency go-to exercises. Peter Levine refers to them as “Contact” exercises because they involve placing attention on areas where you make contact with your body using your hands. Community I added Community because connecting with people, when ready and able, can be very healing for trauma recovery. There are numerous ways social engagement, with psychologically safe (accepting, nonjudgemental, present) people, bring a person out of activation/survival and stimulate other parts of the nervous system (polyvagal theory covers this thoroughly). 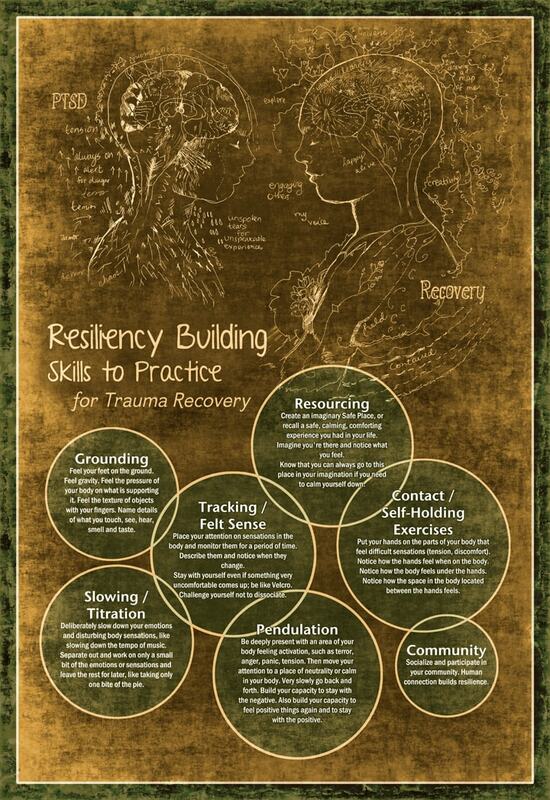 Presence, Self-Acceptance and Self-Empathy are all positive postures to take towards one’s own process of recovery. Recovery is a real process that needs to take place. Recovery really can be something you need to make some extra time for. It can cause limitations in life for a while. Sometimes it’s hard for me to accept the reality of the needs of the recovery process, like time, rest, therapy, relaxation exercises, so many things! – but I think accepting that this is part of my life right now will help me make more progress with it. “Once the professionals accept reality, next traumatees can start to respect themselves, and stop judging and evaluating themselves negatively – usually for the first time since the trauma hit them. You can learn and practice the first 6 Skills of TRM using the iChill ap. In the iChill ap for Android there are 4 Skills – Tracking, Resourcing, Grounding and Shift & Stay (perhaps the iPhone/iPad ap has all 6 I’m not sure). I found the ap very good as a way to learn the skills but didn’t find it quite as useful as a way to practice them. For Tracking, Resourcing and Shift and Stay, rather than just starting the exercise when you click on the skill, the narrator gives a bunch of preamble that I would rather not have to wait through each time I want to practice the skill. It would be nice if they had two buttons: “Learn all about how to do (Skill)” and “Practice (Skill),” rather than have them both mixed together. I do think that iChill is a great way to initially learn the skills because you’re getting the lesson narrated to you rather than reading it yourself. This makes it easier to concentrate on doing the exercise. And one skill – the Grounding Skill – begins very soon without much preamble and can therefore be used to practice whenever you feel you need to ground. In conclusion, I really like the fact that the iChill ap makes these resiliency building exercises available for anyone to learn for free. The iChill ap for Android can be used to learn Tracking, Resourcing, Shift&Stay and Grounding. very happy that I found this in my search for something regarding this.